Dr. Franco Migliori: What do successful plastic surgeons have in common? With medical malpractice claims that are 10x the European average and a a growing trend towards unregulated minimally or non-invasive proceedures, plastic surgery in Italy is a competitive market. Dr Migliori's been an early adopter of new technologies, including the internet, where he's been on the web since 1995, ready for the challenges and opportunities of online marketing. As a plastic surgeon in Italy, how have you seen the aesthetics market developing? Italy has a very competitive cosmetic surgery market due to one of the highest number of board certified plastic surgeons in Europe (more than 1,500) and due to a loosly regulated market, with more than 25,000 so-called "aesthetic surgeons", many of which have much less expertise and skill. Nevertheless, Italian plastic surgery is one of the “top quality” plastic surgery countries, planting its roots back in the centuries with famous names like Branca, Vianeo, Tagliacozzi and Sanvenero-Rosselli, and showing so many contemporary high-level practitioners. Like most places, the patient types are split into “institutional” (gathering all the pathologies, like traumas, tumors, malformations, burns, etc.) treated mainly in public hospitals and paid by National Health System, and “private practice” (which is mainly aesthetic surgery) performed in private clinics and paid by the patients themselves with no insurance coverage. In one way or another, plastic surgery is both available and affordable in Italy. 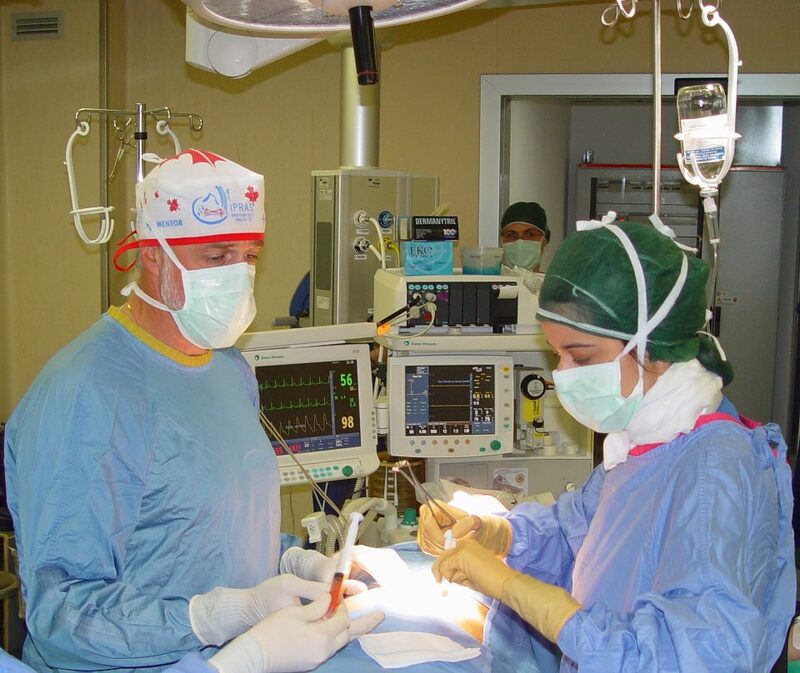 What kind of certifications do physicians need in order to practice plastic surgery in Italy? How is cosmetic medicine regulated? In Italy the board certification is requested to practice plastic surgery. It's conferred by the schools of specialization of the Universities. The run of studies for a certified plastic surgeon lasts five years. Cosmetic surgery is usually performed by board certified plastic surgeons, but there is no legal limitation to other surgeons, so there are many general surgeons performing tummy-tucks, ophthalmologists performing blepharoplasties, ENT performing rhinoplasties, and so on. "Cosmetic medicine" is not regulated at all, and everyone can do it (even non-medical people …). Who are your typical patients? Is there any move towards nonsurgical technologies? I personally perform only “surgical” procedures (breast, nose, face, body-contouring, etc.) but there’s an increasing demand for less-invasive or non-invasive procedure. At the present time, we are witnessing the rise of suspension threads (which are rapidly removing the face-lift) and the diffusion of lipofilling and lipostructure. How does malpractice insurance and liability work in Italy? What typically happens when patients experience complications or are unhappy with results? This is a big problem in Italy. We have almost ten times the number of legal litigations than the European average. That’s mainly due to dishonesty: a) of the patients, claiming to suffer from inexistent disorders; b) of the lawyers, accepting to file a claim without any reason; c) of the consultant plastic surgeons, certifying an inexistent malpractice of a colleague. Any of these figures acts hoping to obtain an economic advantage: few of them do it, most of them have economic damage, and cause present and future damages to people around them. That’s one of the typical stupid human behaviors. A judiciary statistic of few years ago sets at 96% the rate of malpractice claims in Italy where NO DAMAGE is found. Someone should stop this, and the problem is studied in Parliament. Currently, if a patient decides to do this, he claims a damage, finds a lawyer who writes to the surgeon and asks for compensation. Usually the insurance company tries a transaction (discarding the fact that its assisted surgeon is right or wrong) to close the practice with low economic damage, immediately cancels the policy and increases the insurance premium. If a transaction is not possible, the surgeon is sued and most of the times “the Monster is whisked on First Page”, to discover years and years later that he was right. More than that, Italy is one of the last countries all over the world where medical malpractice can be considered (depending on gravity) as criminal offense, as well as murderer. That’s why has been coined the term of “medical burnout” and why it is more and more hard to find young surgeons: too much risk, too high of costs, and too little professional satisfaction. How do you market yourselves to patients and what do you do that your competitors aren't doing? What have you found that works? What hasn’t? How successful are your marketing efforts? 1) Since the beginning of my professional career, I made investments on my skills, trying to give the best of myself. Today I prefer quality to quantity: I think to be a very precise surgeon, and to achieve this I perform the half the average number of operations per year of my colleagues. The quality of my results is wonderful advertising, and I have a high percentage of new patients who are friends or relatives of my old patients. 2) I self-built and self-published the first edition of my web-site on 1995: at that time no-one had yet understood the power of this instrument. Today a good reputation on the web (certainly helped by the quality) is a wonderful source of new patients. All the above works very well. It took many years, of course, but today I make very few marketing efforts with very good results. I don’t think that money is a good marketing strategy, and if you want to perform “low cost” surgery you will get “high cost” problems. Similarly “telling lies” is not a good strategy, it can provide very quick results, but it ensures quick and painful falls as well. Have you seen any marketing by other physicians that you would consider to be "unethical" in some way? “Unethical” is lying. Whenever one surgeon says to perform something that he is not skilled to do, says that a procedure is “risk-free”, says that the result is 100% guaranteed, says that he has no complications, alters the number of treated cases and so on, that’s unethical. I see this every day since decades, not only in Italy but everywhere. Lies have no boundaries. You are an active member of various international medical societies. As a plastic surgeon in Italy, why have you chosen to be a member of international medical societies? Do you think that American societies are perceived to be superior to Italian medical societies in any way? First of all, I am proudly member of the Italian Society of Plastic Surgery, and Italian plastic surgery, as I said, is one of the more ancient and prestigious of the world. I think that “Italian” feelings and skills are perfect to form a high-level plastic surgeon, I think that Italian people have a good perception of this, and they don’t think that many foreign plastic surgeons are superior to ours. More than that, the highest level and more selective international society of which I am a member is the European Society of Plastic Surgeons, which has a great community of very good Italian plastic surgeons. My international affiliations are prestigious, of course, but are mainly due to keep contacts with a lot of valuable colleagues around the world, to participate to high level international meetings, to be subscribed to prestigious scientific journals and to publish on them. As a plastic surgeon, where do you see new cosmetic technologies developing into capabilities that surgeons don't have? Do you see technology or other treatments like stem cell therapies or drug/hormone therapies replacing or being synergistic to surgery in the future? I think that technology will almost quickly replace the majority of surgical procedure: in the last 30 years, the amount of surgical invasiveness has dramatically decreased, and today we have already shifted many procedures to “low-invasiveness” or “non-invasiveness”. The future of the surgery as a whole (not only plastic surgery) is doomed and, sooner or later (decades, centuries, I don’t know), surgery will disappear from the face of the earth. Before talking to a patient, listen carefully to him. Listening to a patient requires forbearance, develops empathy, and is the strongest insurance policy at the lowest cost. About: Born in Genoa (IT) in 1956. Dr. Franco Migliori took a Medicine degree in 1980 at Genoa University, and then he got board certified in Plastic Surgery at Pavia University and in Dermatology at Genoa University. In 1991, he was board certified in Aesthetic Plastic Surgery at Pavia University. Dr. Migliori has performed hospital practice since 1981: he trained in several centers of excellence in Italy and abroad during the ‘80s, and made his career at the Plastic Surgery Unit of “San Martino” University Hospital in Genoa (IT) during the ‘90s, where he became Director in 2001. Under his leadership, he has especially developed the post-bariatric body-contouring, breast reconstruction, head and neck reconstructive surgery (tumors and traumas), lower limb reconstructive surgery (degenerative diseases and traumas). In 2010 his Unit has been awarded as a Scholarship Institution by EURAPS among other European Centers of Excellence. He has been in private practice as well since 1981, during which time he developed a great deal of experience and skill in rhinoplasty, augmentation mastoplasty, reduction mastoplasty, mastopexy (he conceived and published a personal technique), abdominoplasty, brachioplasty, thigh lift, liposuction and lipofilling, blepharoplasty, otoplasty, lips enhancement. • Active Member of EURAPS (European Association of Plastic Surgeons). Furthermore, he is a member of: TNS (Triple Nine Society), ISPE (International Society for Philosophical Enquiry), OATH (One-In-A-Thousand Society), Glia Society, Mensa International.